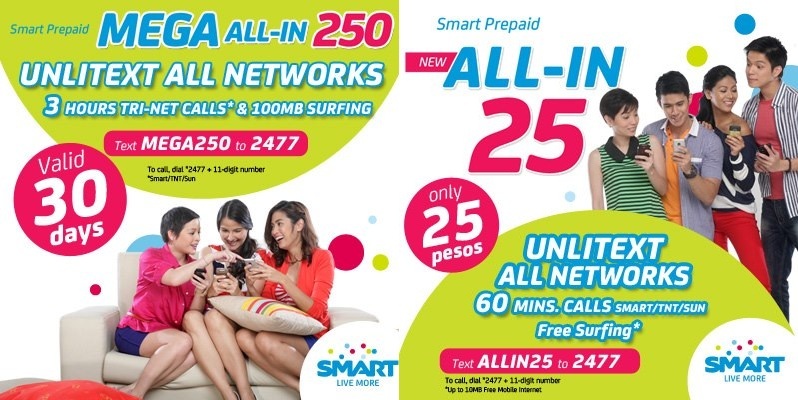 Smart Communications introduces their best unlimited deals to date with All-In 25 and Mega 250. These call and text packages offer great unli-deals from the wireless leader in the country. All-In 25 gives you unlimited texts to all networks and 60-minute calls to Smart, Sun and Talk ‘N Text for one day. It also comes with a bundled 10MB mobile internet allocation. All-In 25 is valid until November 15. Meanwhile, Mega 250 also offers unlimited texts to all networks with 180-minute of calls for Smart, Sun and Talk ‘N Text – valid for 30 days. Likewise, the 100MB mobile internet allocation will keep you online whenever you need it. Mega 250 is valid until October 30. To register, just key in ALLIN25 and MEGA250 to 2477.